There comes a time in a parent’s life where they’ll hear, “Mom/Dad, can I have a sleepover?” When this time comes, there are three fun and kid-friendly beauty products to keep the fiesta going: Hot Stamps, Hot Jewels, and Hot Designs. They are perfect for any girly girl’s get together! Hot Designs, Hot Jewels and Hot Stamps are 'As Seen on TV' commodities. I have one tween and one teen in the house that are the perfect age for these fun beauty products. They like to be girly and play around with different hair, nail and jewelry pieces. Emma and Juliann have enjoyed being able to play around with Hot Designs, Hot Jewels and Hot Stamps. It gives them a beauty outlet without making them look too grown up. Emma and Juliann's hair has been lookin' glitzy lately. Almost every day they apply Hot Stamps to their manes for a delightful diversion from the everyday hair look. 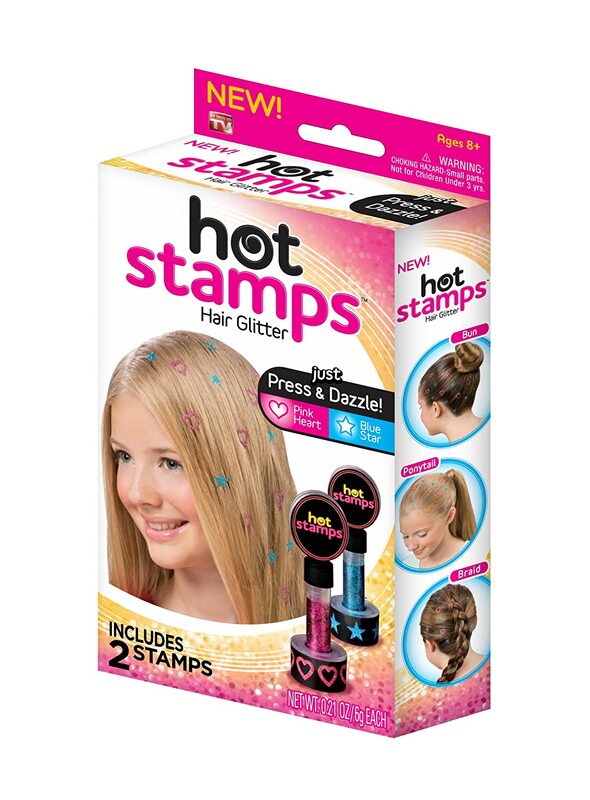 The hair glitter stamps won't damage hair and the patterns stay in place most all day. The designs are placed onto the hair by stamping (or pressing) them on. It's best to place a couple of fingers under the strands of hair you want to apply a stamp to so that there's even pressure distributed. The end result is a small glitter shape. You can apply as little or as many you want to your hair for a snazzy effect. Although it's not the real deal, Hot Jewels imitates jewelry in the form of temporary tattoos. They are metallic with primary colors of black, gold and silver. With trendy designs, Hot Jewels are a swank way to accessorize your skin. Application to the body is done the same way as regular temporary tattoos. Hot Jewels lasts from four to six days and can be removed with baby oil. I, along with Juliann and Emma, have used Hot Jewels for astonishing effect. My oldest daughter has remarked she'll be purchasing some to enhance her roller derby persona when season starts next month. Hot Designs nail art pens make polishing and ornamenting your nails an effortless task. Each kit has three nail art pens with a total of six colors. They are cylinder shaped with a flat base at each end. By unscrewing the cap on the end of the desired shade, you can apply nail polish like normal. Once you're done with that, a small nail art tip comes out if you pull off a cap. The art tip is very thin and the nail polish squeezes through it for tiny and precise utilization. It's important to let the base polish dry before creating designs with the nail art pen. This will keep smudges from forming. A design guide is included with each kit and it gives ideas on a few designs to create. 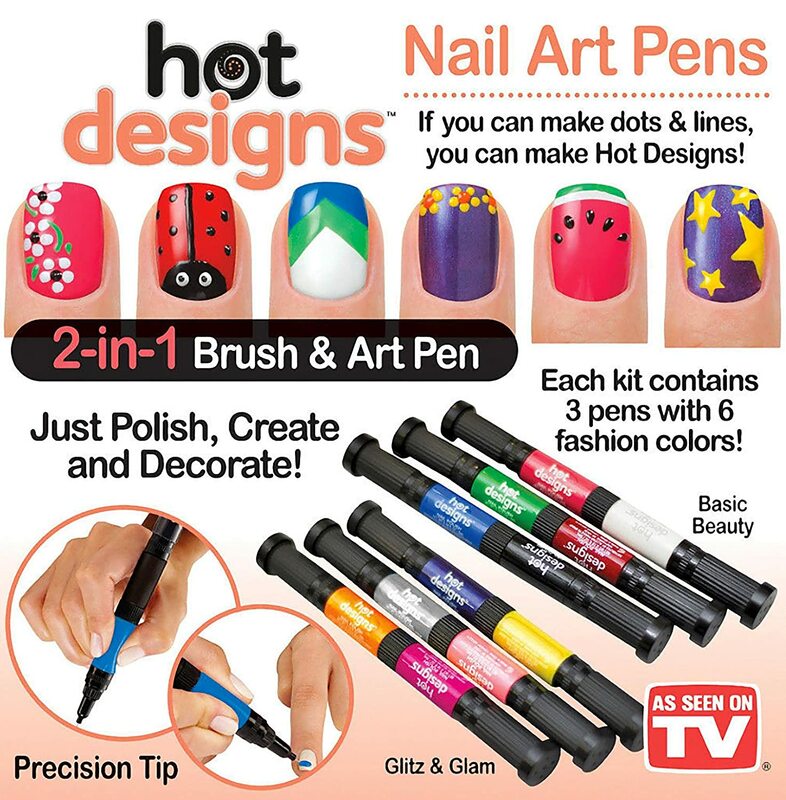 Hot Designs makes it easy to both polish and decorate your nails at once. Two people will each win sets of Hot Designs, Hot Jewels and Hot Stamps. I would love to experiment with the nail art pens. Me and my granddaughters would have a blast. The hot jewels look like a fun product to try. I like Hot Stamps for my granddaughter. I would like to try the hot stamps. I'd like to try the nail art pens. I would like to try the hot jewels with my granddaughter. I am most excited about hot designs. I can see my daughter loving those. I'm excited by the Hot Jewels for myself. We'd love the Hot Designs! I love nail art so I'd be most excited for the Hot Designs! All of them! But I have been dying to try the hot designs. I'm most excited to try Hot Designs. I'm excited to try Hot Jewels. I would love to try the Hot Designs! I would love to try the Hot Jewels. My daughters really want to try the hot stamps. I would like to try the hot jewels. I'm most excited about Hot Stamps - I've never tried anything even remotely like it before! My daughter would love to try the Hot Jewels. Me and my daughter would try the Hot Designs first. We love doing our nails. I've been wanting to try the Hot Jewels forever! I'm really excited about trying Hot Designs for my nails. I'm most excited for the Hot Designs. I'm excited to try the Hot Designs. I have always wanted to try the Hot Designs. I want to try the hot designs. I would use Hot Designs first! I want to try hot jewels. I am most excited to try Hot Designs for my Nails! I want to try the Hot Jewels. I think my girls would love the Hot Designs the most. 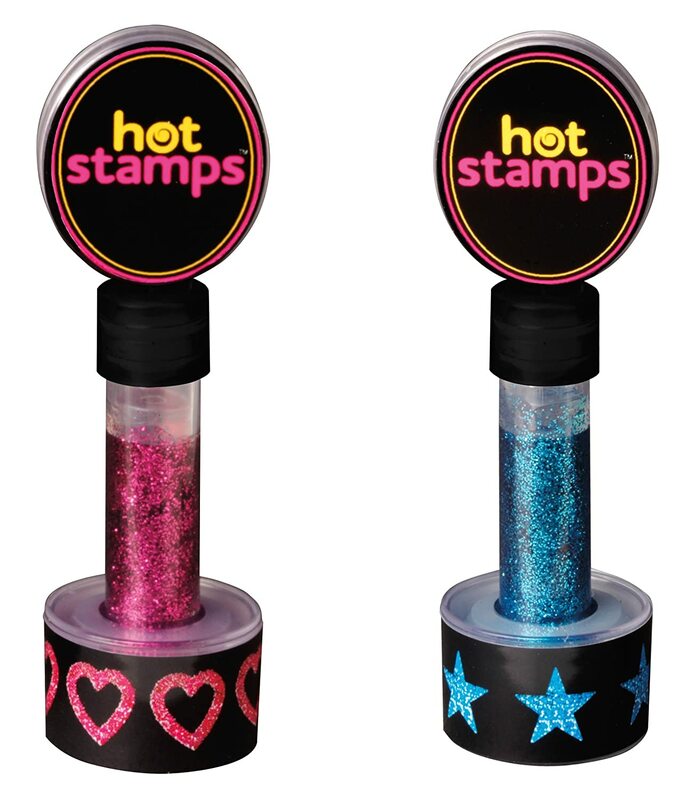 I would try the hot stamps first, they look like a ton of fun! I would love to try the hot designs nail pens! Our daughter is excited to try the Hot Jewels. I think the hot designs is going to be the most fun.